My Sunday's are anything but restful! My almost 10 month old and my new calling as nursery leader keep me running and leave me completely exhausted by the time I get home at 4:30 p.m. Dinner is the last thing I have time to worry about anymore. But I still want a good Sunday meal. So from now on Sunday's have become "Crock Pot Sundays"! I don't have a lot of crock pot recipes, but I'm on a mission to research and/or create a collection of crock pot recipes that will satisfy my Sunday dinner appetite. 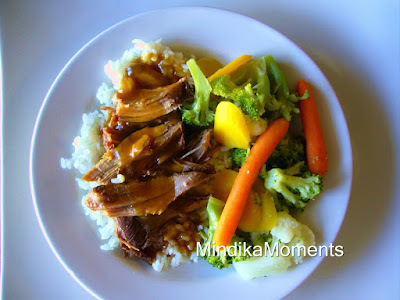 Today was my first...Teriyaki Pork Roast. Pretty simple, nothing to inventive or exciting, but it worked for this week. Be prepared for more Sunday crock pot recipes to come. 1. In a slow cooker, mix apple juice, sugar, soy sauce, vinegar, ginger, garlic powder and pepper. Add roast, turning to coat. Turn fat-side up. 2. Cover and cook on high for 3-4 hours or on low for 7-8 hours or until meat is very tender. 3. Transfer meat to a warm platter. Cover and keep warm. 4. Strain cooking liquid and place in a saucepan. Skim off the fat if desired. Over medium heat, bring to a boil. 5. Meanwhile, in a small bowl, make slurry by mixing the water and cornstarch until smooth. Stir into boiling liquid. Continue stirring until liquid thickens. 6. Serve roast with rice and sauce. okay, this looks so good. Just like EVERYTHING else. I'm seriously having a hard time planning out my menus cause you give me so much yummy stuff to want to make! This really is one of the BEST food blogs ever. Yours and Covo w/a cupcake :) Keep em coming!! Shoot, I just did roast on Sunday. Wish I would have had this recipe. Definately going to try this.